The newly designed 2018 Mitsubishi Eclipse Cross is a sporty new crossover that provides drivers with all-new experience. Larger than the previous Eclipse model produced by Mitsubishi Motors in the past, the Eclipse Cross has a spacious and modern interior and exterior. The all-new 2018 Mitsubishi Eclipse Cross is available in ES, LE, SE and SEL trim levels and all trims are equipped with a 1.5-liter direct-injected turbocharged engine that is exclusive to the Eclipse Cross. The engine is paired to an 8-speed Continuous Variable Transmission (CVT) and the powertrain produces 161 horsepower and 184 lb-ft of torque. Thanks to the efficient engine, the Mitsubishi Eclipse Cross has an average fuel economy of 26 mpg in the city and 29 mpg on the highway. With the exception of the Eclipse Cross ES (base trim), the Eclipse Cross is available in all-wheel-drive as well as front-wheel-drive. While there are many other similarly-sized crossovers on the market, the 2018 Mitsubishi Eclipse Cross has everything most buyers are looking for today, and features that few other crossovers offer. The sleek new design of the 2018 Mitsubishi Eclipse Cross includes available exclusive black front grille and LED headlights. The 2018 Mitsubishi Eclipse Cross also offers available large 18-inch aluminum wheels, standard on every trim except the base trim (Eclipse Cross ES). Higher trims have automatic on/off headlights, a chrome upper grille for increased aesthetic appeal, power folding side-view mirrors, the option to opt-in for a dual-pane power panoramic sunroof, and black roof rails. The Mitsubishi Eclipse Cross also carries LED running lights and rear combination tail lights, an LED high mount stop light, fog lights, rear privacy glass, heated exterior mirrors, a roof spoiler, and rear window wipers. Almost all 2018 Mitsubishi Eclipse Cross trims are equipped with 18-inch wheels, but the base trim rides on 16-inch wheels. The 2018 Mitsubishi Eclipse Cross provides a standard rearview camera, available head-up display and leather appointed heated front seats, generous comfort for all seated, in a technology infused premium vehicle with lots features drivers will love and appreciate. Some of those features include keyless entry with push to start button, rain-sensing wipers are standard on the Eclipse Cross SE and SEL trims, and available on the other trims. Leather upholstery is available as well. The SEL Touring option package provides heated rear seats and steering wheel, a power dual-pane sunroof and auto-dimming rearview mirror with a convenient garage door opener. Best of all, integrated collision avoidance and driver assist systems are included in the SEL Touring to provide premiere safety features for owners. Available features for the 2018 Mitsubishi Eclipse Cross include a 7.0-inch touchscreen, 360-degree-view camera system, Apple CarPlay and Android Auto with the available a 710-watt premium audio system. Owners can feel immersed in fantastic sound and get SiriusXM Satellite Radio for three months, Mitsubishi Connect, a six-speaker system, steering-wheel voice controls, a multi-view camera system, a heads-up display, FAST-key passive entry with panic button. The SEL trim has the option to upgrade to a Rockford-Fosgate nine-speaker premium audio system and an auto-dimming mirror with Homelink. The 2018 Mitsubishi Eclipse Cross has automatic collision notification, SOS emergency calling, safe teen driving monitors related to speed, curfew and even location boundaries. Mitsubishi provides a trial period and costs from $99 to $228 annually, depending on the package. Driver assistance and collision avoidance systems are also available. Cross traffic alert features are standard for all models except the ES and LE trims. SEL Touring package furter installs forward collision warning with automatic emergency braking. Mitsubishi vehicles come with top-of-the-line amenities and industry-leading warranties. 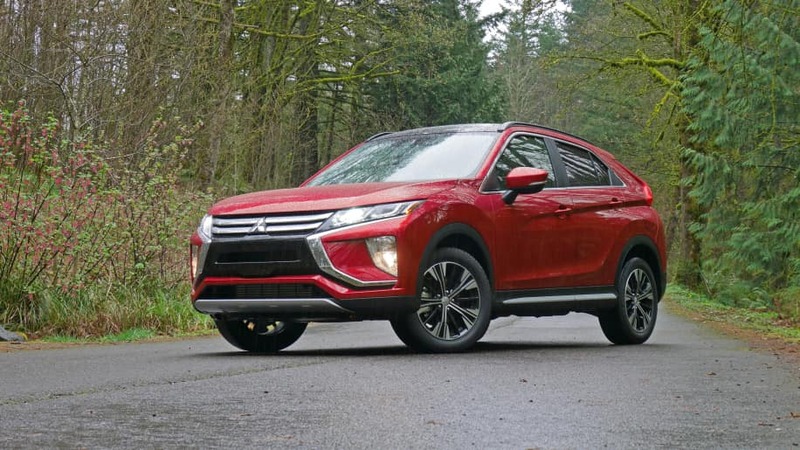 The Mitsubishi Eclipse Cross is backed by a five-year or 60,000-mile limited basic warranty, a 10-year or 100,000-mile limited powertrain warranty, and a 7-year or 100,000-mile anti-corrosion and perforation limited warranty, and roadside assistance comes standard for 5-years.